Norma Winstone has long been recognised as one of the UKs foremost vocalists and lyricists. She has, over the course of her career followed her own path, and in doing so explored a wide variety of musical experiences from singing material from the Great American Songboook, along with singing wordlessly or adding her own distinctive lyrics to existing compositions. Her versatility and her excellent sight reading skills would find her placed her in situations not often frequented by singers, as stints with the bands of Mike Westbrook and Michael Garrick in the sixties, and Ian Carr's fusion outfit Nucleus testify. In the late seventies she formed the trio Azimuth with pianist John Taylor and trumpeter, Kenny Wheeler. The group recorded five albums for ECM between 1979 and 1994, and Norma also recorded her own album with a trio of Tony Coe and John Taylor, Somehwere Called Home in 1986. This group of recordings, with their small and intimate setting produced chamber jazz of startilng beauty, and indications were that this was an extremely fruitful format for Norma. Fast forward to 2001 and the formation of the current trio with German reedsman Klaus Gesing and Italian pianist, Glauco Venier, and once again we have some stunning music performed by Norma and her cohorts that has spanned some seventeen years, and with the release of their fourth album for ECM, Descansado - Songs for Films, shows that the trio are still eager to explore new territory and expand the concept of the music. It was therefore a pleasure to once again to interview Norma, and talk to her about the new album, and ask where the idea of songs from films for the repertoire came from? "It was really an idea from our pianist Glauco Venier", explains Norma. "I would often hear him playing beautiful pieces at a sound check and they often turned out to be film themes. We decided that it might be interesting to explore some film themes to see if we could adapt them to fit our 'sound'." 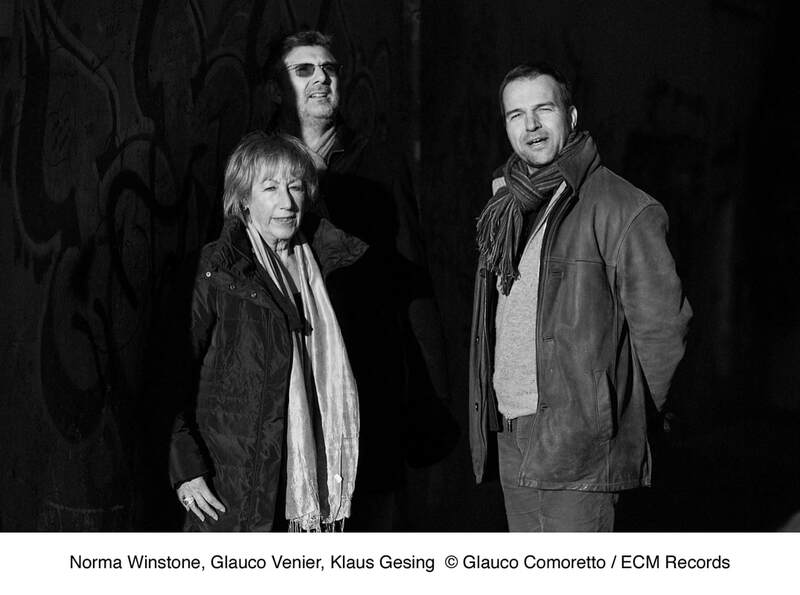 As a long time fan of Winstone's and this particular trio I was eagerly looking forward to the hearing the album, but at the same time somewhat dismayed to hear that Norma, Klaus and Glauco would be joined by two additional instruments with percussionist, Helge Andreas Norbakken and cellist Mario Brunello augmenting the trio on some of the pieces. My worries abut any change affecting the overall group sound that had been forged over an extended period of time were totally unfounded, and as the Norma was quick to point out, "Having already made three recordings with just the trio we thought that the next one should be different in some way. The choice of the music we decided upon made us think that cello and percussion could enhance some of the pieces by somehow increasing the depth of sound in places, making them more 'orchestral'. Glauco had performed with the cellist Mario Brunello and loved his sound and he thought that percussionist Helge Andreas Norbakken (whom we had all heard only on recordings) has such an original approach that his participation would add to the 'soundscape'." The collective decision to bring in the new musicians works out supremely well, despite the fact that they had not played together before, "except for Glauco having played once with Mario", adds Norma. Continuing the singer says "Mario is of course a wonderful classical player and played mostly written lines, which was what we expected whereas Helge Andreas improvises all the time and we just left it to him to decide how to integrate, which we have discovered is especially wonderful in a live concert situation." If the decision to add new textures and nuances to the trios very distinctive and detailed ensemble sound by bringing additional musicians was a brave one, then Norma decided to take this a step father by recording material that for the album that was all new and not previously part of the trio's repertoire. With the introduction to the wonderful melodies exploring music written by Michel Legrand, Ennio Morricone, Luis Bacalov from films of Scorsese, Wenders, Zeffirelli, and Olivier, of Winstone's sensitive lyrics the singer also employs her fondness for stepping away from a more traditional role of a vocalist as an interpreter of the lyric but as a member of the ensemble using her voice wordlessly. This is heard on the wonderful 'Vivre Sa Vie', 'Lisbon Story' and 'Meryton Town Hall', so I ask what drew her to these particular songs to interpret in this manner? "Lisbon Story' struck me immediately as a nice vehicle for our sound and I thought that words were unnecessary, 'Meryton' was the same", says Norma. "I can't imagine what lyrics I could have written to this one (I am sure that they would have been trite!). 'Vivre Sa Vie' was suggested at the recording session as a favourite piece of Manfred Eicher's. We found the sound recording on the internet and both Klaus and Glauco transcribed it and we recorded it the next day. I sang just what I thought necessary for the piece and words were not needed. I think it's a beautiful piece." This off the cuff approach is made all the more remarkable by the sheer quality of the music played, giving the impression that the pieces are far more rehearsed. Norma has always maintained that as a trio they always try to keep things fresh and not repeat themselves from one performance to the next. Add to this, the trio's interpretation to the music, that in most cases existed without words and Winstone adding her own lyrics for the recording, then what we have is another stunning album from a group that takes its influences from jazz as a starting point and then goes off on its on way encompassing pop, classical and anything else that the three musicians decide that will fit their collective identity. Norma would certainly like to see this music performed widely, and toured, "if possible, yes... if funds will allow", and in the meantime we can settle down and listen to another fine album from Norma, Klaus and Glauco that will draw you into the close and intimate sound world of this most unique of ensembles. For more information visit ECM Records and Norma's website.